Composers Robert Mann and David Diamond. 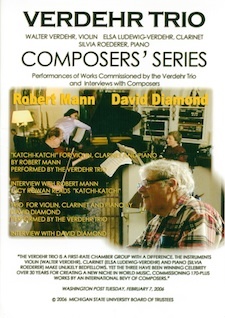 Performances of Mann's Katchi-Katchi and Diamond's Trio, both commissioned by the Verdehr Trio, plus interviews with the composers. Hosted and edited by Walter Verdehr. 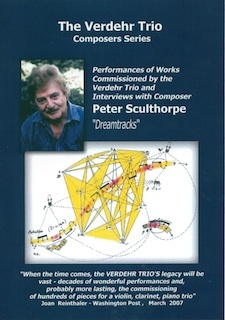 Performances of Sculthorpe's Dreamtracks, commissioned by the Verdehr Trio, plus interview with the Peter Sculthorpe. Composers James Niblock & Peter Schickele. 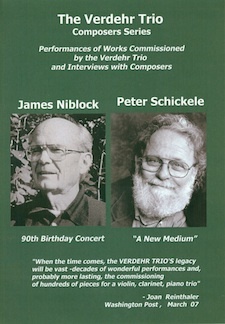 Performances of Niblock's Double Concerto II and Medieval Suite and Schickele's Serenade for Three, all commissioned by the Verdehr Trio, plus interviews with both composers. Hosted by Peter Schickele and Walter Verdehr and edited by Walter Verdehr. Composers Betsy Jolas and Philippe Manoury. 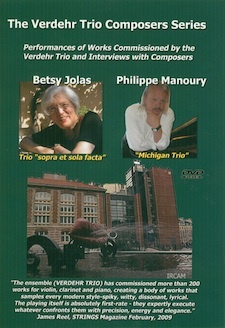 Performances of Jolas' Trio Sopra "et sola fact" (1998) and Manoury's Michigan Trio, both commissioned by the Verdehr Trio plus interviews with both composers. Composers Bright Sheng and Alexander Arutiunian. 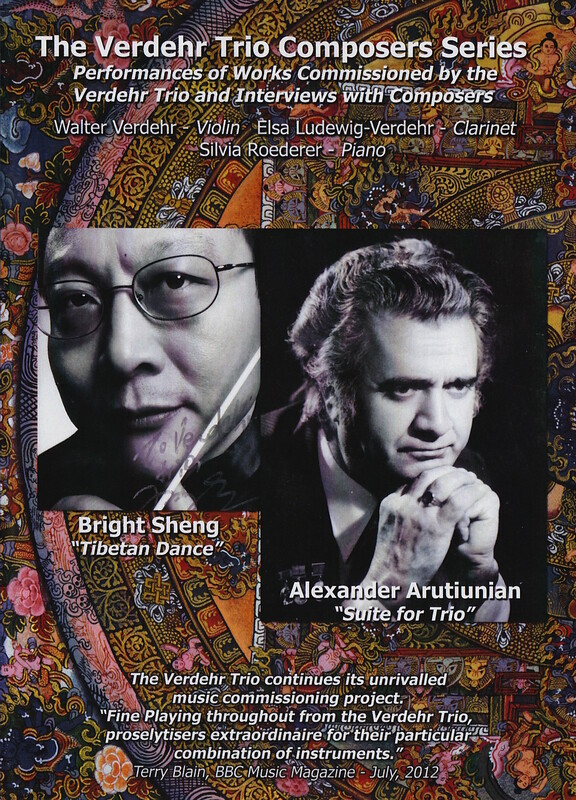 Performances of Sheng's Tibetan Dance and Arutiunian's Trio, both commissioned by the Verdehr Trio, plus interviews with the composers. 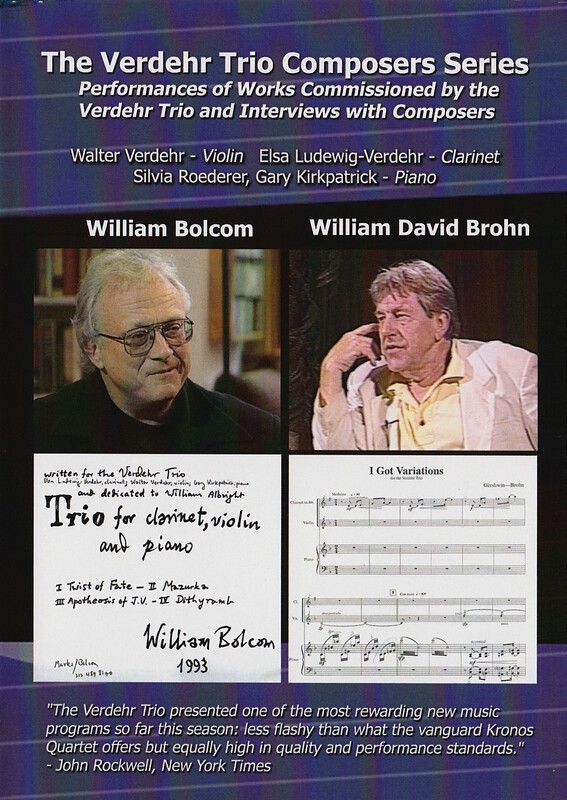 Composers William Bolcom and William David Brohn. Performances of Bolcom's Trio and Brohn's I Got Variations, both commissioned by the Verdehr Trio, plus interviews with the composers. 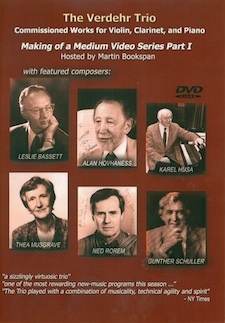 Composers Leslie Bassett, Alan Hovhaness, Karel Husa, Thea Musgrave, Ned Rorem, Gunther Schuller. Performances of Bassett's Trio, Hovhaness' Lake Samish, Karel Husa's Sonata a Tre, Musgrave's Pierrot, Rorem's End of Summer, Schuller's A Trio Setting, all commissioned by the Verdehr Trio, with Gary Kirkpatrick, piano. Hosted by Martin Bookspan and produced by Eric Schultz and WKAR TV, Michigan State University. Composers Gian Carlo Menotti, Joan Tower, Libby Larsen. 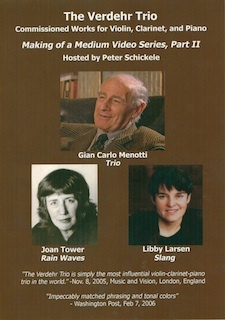 Performances of Menotti's Trio (Kathryn Brown, piano), Tower's Rainwaves, Larsen's Slang.